Looking for a fun way to introduce Biblical truths to children? Want to try family devotions but wonder where you'd find the time to get it all organized? Need to find activities that would be appealing to a range of ages? 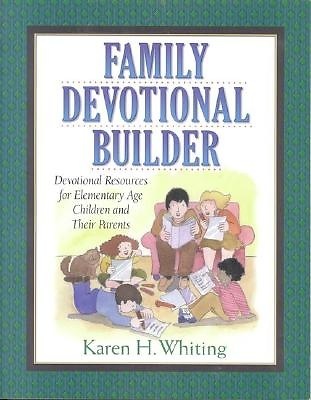 Karen H. Whiting makes it easy to pursue the practice of a family devotional time by sharing the creative devotionals that she has been using with her own children for over 20 years. "Family Devotional Builder" features 50 weeks of simple, fun activities that relate to and expound upon scriptural themes. An additional seven weeks of "special times" devotionals deal with topics such as "healing, hurt feelings, " and "victory celebrations." • Each colorful page spread features a theme activity for three days of a week. Using just three days in the "week" it's easy for busy families to consistently incorporate the devotional times into their lives without feeling overwhelmed or falling behind. • Every week features a different biblical theme with supporting scripture for each of the three days--to help reinforce the concept. • Most activities only take about 10-20 minutes and require very little preparation time. • Full color illustrations and graphics throughout help explain the activities and make the devotionals fun and easy to use for the whole family. • Activities include: drama, storytelling, Bible reading, crafts, cooking, analyzing TV viewing and music in light of scriptural concepts, and more. • Subjects include: learning about prayer, discovering truths about God's nature, enhancing family communication, providing service to others, developing compassion, practicing hospitality, and more. • Topical and scripturalindexes provide easy reference if the family wishes to pursue devotionals by theme or scripture reference. • An excellent resource for young families, Sunday School teachers, pastors and children's ministry leaders. A great gift item for any family.